More generally, those predicting, or advocating, the euro’s demise tend to underestimate the technical difficulties of reintroducing national currencies. In the conclusion, he says "I argued that it is the roach motel of currencies. Like the Hotel California of the song: you can check in, but you can’t check out." To be precise, that's true of the Roach Motel (see here, if you don't know what that's all about), but, according to the Eagles, you can actually check out of the Hotel California, though you can never leave (hmm... sounds kind of like "Brexit"...). 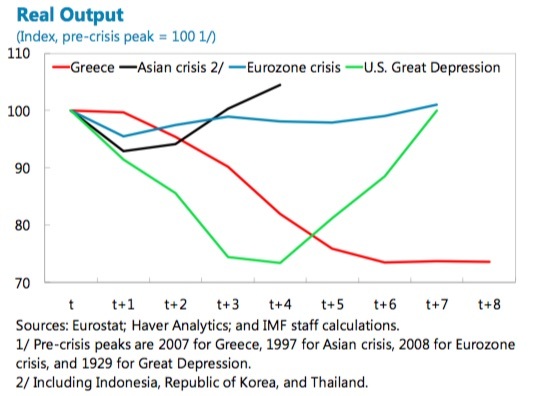 The IMF also released a self-evaluation of its Greece program, which Charles Wyplosz analyses in a VoxEU column. See also: this Martin Sandbu column and this article by Landon Thomas. Matt O'Brien's write-up of research by House, Tesar and Proebsting of the impact of austerity in Europe is also relevant. 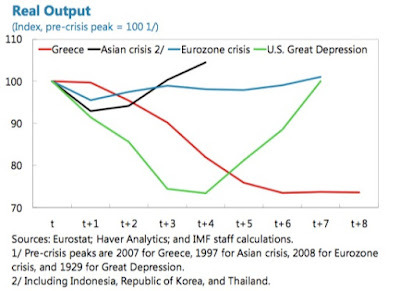 The fact that the eurozone rolls on with no sign that a depression in one of its smaller constituent economies is enough to bring about a fundamental change is disturbing. It wouldn't be able to ignore an election of Marine LePen as President of France - Gavyn Davies considers the consequences of that. Update: Cecchetti and Schoenholtz also had a good post on the implications of a LePen win. As he prepared to sign orders designed to roll back bank regulations enacted to stop the next financial crisis, President Donald Trump said that the rules are stifling lending. “We expect to be cutting a lot out of Dodd-Frank, because frankly I have so many people, friends of mine, that have nice businesses and they can’t borrow money,” Trump said on Friday. “They just can’t get any money because the banks just won’t let them borrow because of the rules and regulations in Dodd-Frank." While rolling back restrictions on the financial sector seems contrary to the Trump administration's populist veneer, it is consistent with what he said he would do during the campaign. Banks don’t actually “hold” capital. In banking, capital refers to the funding they receive from shareholders. Every penny of it can be loaned out. A 5 percent minimum capital requirement means that 5 percent of the bank’s liabilities has to be equity, while the rest can be deposits or other borrowing. The more equity a bank has, the smaller its risk of failing when losses pile up. On their blog, Cecchetti and Schoenholtz summarize findings that higher capital not detrimental to lending. Its not clear that Congress will undertake a full repeal of Dodd-Frank, but there are plenty of ways it can be weakened. Brookings' Robert Pozen outlines some of the things that may happen. At Vox, Matthew Yglesias argues that Dodd-Frank has been successful. This paper by Martin Baily, Aaron Klein and Justin Schardin provides a more detailed assessment of its provisions. John Cochrane has favorable views of some of the Republican alternatives, though its far from certain that there will be action on them. "I don't think you protect investors by limiting choices," said Cohn, who previously was Goldman Sachs' COO. "We think it is a bad rule. It is a bad rule for consumers," Cohn told The Wall Street Journal. "This is like putting only healthy food on the menu, because unhealthy food tastes good but you still shouldn't eat it because you might die younger." See columns by Steve Rattner, Paul Krugman and Mike Konczal. Overall, the administration's approach to financial regulation may have short-run benefits to the financial industry, and its not surprising that financial stocks largely drove the gains in the stock market after the election. Looser reins and more profits on Wall Street also likely mean bigger bonuses - before the crisis, financial industry compensation had been a substantial contributor to widening income inequality, and that trend seems likely to resume. Rolling back or watering down Dodd-Frank also will increase the likelihood of another financial crisis, which we should know all too well from recent experience can have severe negative effects on the economy as a whole - from January 2008 through December 2009, nonfarm payrolls dropped by 8.6 million before beginning an agonizingly slow recovery. Trashing the fiduciary rule and increasing the likelihood of future financial crises will also be detrimental to Americans' efforts to save for their retirements. While there's been a short-run boost to financial shares, overall, the risk of severe losses is increased, as is the likely proportion of savings that will be eaten up by fees. That is, Americans will be poorer and less financially secure in their old age. Update (2/12): CNBC's Ylan Mui reports on efforts by Jeb Hensarling, chair of the House Financial Services Cmte., to go after the CPFB. The NYT has an op-ed by Vanguard founder John Bogle on the fiduciary rule. Meanwhile, at the Fed, Daniel Tarullo, who has led efforts on regulation, is stepping down from the board, causing financial stocks to jump.